are all commonplace these days. Young people who have been the most adventurous in the past are hiding inside and are scared of life. The less you challenge yourself the more complacent you become. You do not act. Life happens to you. Fear becomes your daily companion. When you never try anything really scary you get scared by things that aren’t scary. When I was a kid I was scared of darkness. As a teenager and twen I made a deliberate effort to walk at parks at night. Was it dangerous? I don’t think so. Was it scary? Yes it was a bit but I got used to it. Later on I would partly undress and enjoy the darkness during summer. When I met other people in the darkness I realized that they were much more scared than I was. They went rigid and started to hurry when they saw me. One day when I was on vacation with my parents I took a walk in a park. Two young men walked behind me and started talking as if they were up to something. I realized that these guys tried to scare me. I think I was like 16 or so but instead of going faster I started walking slower and more consciously. I felt like an animal ready to leap. As I was used to walk in the dark in a big city I wouldn’t let some tourists scare me in a holiday resort where the biggest crime was probably a shattered window. Now that I’m older and look quite scary with dark hair and beard I try to wear bright and colorful clothes in the dark so that I’m visible and people, especially women don’t get scared. When I train parkour outside – during daytime – I make sure not to scare people when I appear out of nowhere or jump in a completely unexpected place. Now that I do scary looking things like jumping from bridges or running up walls for no apparent reason I seldom experience fear. That might sound like a paradox. You might expect that I’m still scared of heights or hurting myself. Are you scared when crossing the street? No? Why? When you get used to something – even something life-threatening like motorized traffic – you know you can assess the risk and deal with it accordingly. It’s not the point to live longer but to live deeper. Most people are not really alive. 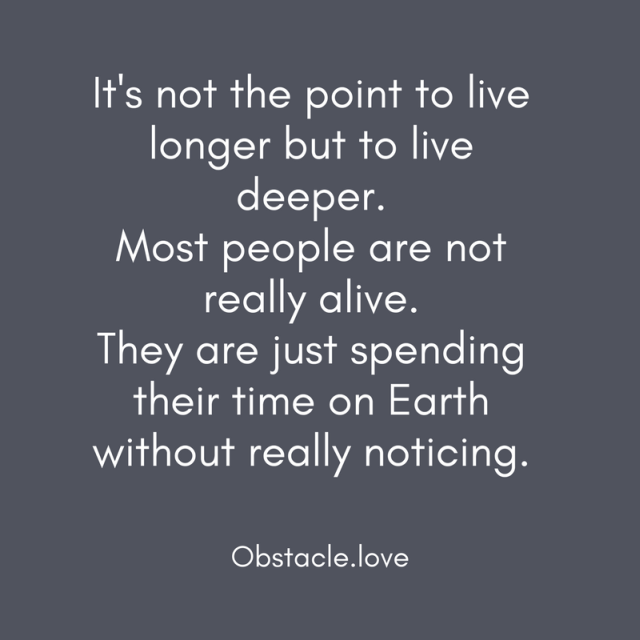 They are just spending their time on Earth without really noticing. Don’t get me wrong. I don’t promote the “live hard, die young” myth here. Crippling yourself by alcohol, drugs, fast food, car accidents or parkour injuries is equally to be shunned. I mostly get scared when encountering new situations. In places where I haven’t jumped or climbed before I am much less likely to perform well. I have to climb that place over and over again to prove to myself that I can do it and that’s it’s not just luck. Self-confidence has to be built up like a muscle. When you always play it safe and do not risk anything you also get scared easily because you don’t know what you are able to do. Your abilities waste away without practice. When you live 120 years but the last 40 years you can barely move because you’re fat, sedentary or both is such a life really worth leading it? or public transport. You sit crammed in tiny seats on a plane. You were not designed to be sitting. The only sitting that makes sense is sitting meditation. I practice Zen mediation like monks in Asia do for example. Live now and be present. Whenever you feel strain from sitting get up and move. Ideally don’t sit down in the first place. You can even meet with people while walking. Now I train parkour so that some people think I’m crazy or suicidal. Yet the every day insanity I witnessed first hand was the real problem. I needed very long to realize this. When you sit all day you kill yourself slowly but continuously. Only regular movement and exercise (both of them) can prevent chronic health problems and premature aging. Being sedentary is not a life-style it’s a type of death you subject yourself to. It’s a slow excruciating agony you will suffer from for decades unless you die of an “accident” due to your weakness. Thus embrace the every day challenges. Do not sit still. Move and explore both literally and metaphorically. I’m still trying to learn this but the obstacle is the path. ← This is Stupid and Dangerous!